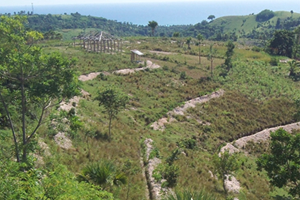 Contour canals along a hillside in rural Haiti. Photo courtesy of Professor Scott Freeman. When the Dust Bowl devastated agricultural economies across the US during the 1930s, soil conservation emerged as a necessary precaution against future disasters. With the Dust Bowl on their minds, development workers who went to Haiti in the 1940s imported their need to protect soil along with their aid dollars. But more than 60 years after development workers exported that panic to Haiti, foreign aid still supports soil conservation efforts. According to Freeman, an anthropologist who has worked with rural Haitian farmers and just co-edited the book Who Owns Haiti? People, Power, and Sovereignty, soil conservation efforts supported by foreign aid just aren’t working. Continuing these same aid efforts for decades without evidence of any substantial benefit to local farmers should raise concern. One method of soil conservation that stands out as particularly visible on the landscape, but provides questionable value for farmers, is digging ditches and contour canals on sloping hillsides of farmland. The concept is simple: Dig a canal, prevent soil erosion. “The idea is that when rain hits the soil and carries soil downward, if you’ve dug a canal, the rain will just fall into that canal. The canal will stop the rapid flow of the water and the soil, and it will collect there rather than go all the way down the hill,” said Freeman. Not only have decades of similar development interventions failed to create long-term benefits for farmers, but also they have also failed to acknowledge or incorporate the agricultural experience and labor traditions of rural Haitian farmers who work the country’s soil. “Soil becomes a domain in which there’s this relatively quiet and continual struggle between the international aid financing for environment and development and the strategies and knowledge of the people working there. The two aren’t necessarily working together; and in fact, I think they’re sometimes working against each other,” said Freeman. Digging contour canals is a short-term solution targeted directly at individual farmers, and it seems to exist in a vacuum where larger structural and economic issues, like low tariffs that encourage importing food from the US, work in opposition to small-scale farmers. One of the farmers that Freeman worked with in Haiti described contour canals as a metaphor for the way international agencies approach aid in rural Haiti: The canals are tiny projects that offer farmers very little benefit because, in the long term, that soil is travelling downhill. Beyond failing to alleviate stress on the soil created by a host of economic factors outside of farmers’ control, international development aid earmarked for soil conservation tends to misunderstand the practice of rotational group labor in which rural farmers participate. Rather than tend their individual lands alone, rural farmers work collectively on each other’s lands—one day a group of farmers will work the land of one member, the next day they will work the land of another. “Rotational labor is about sharing the benefits accrued. Rotational labor is about the collective and not the individual,” said Freeman. This lack of division between individual and group wellbeing leads Haitian farmers to consider the labor they perform to create contour canals in exchange for aid money as “categorically different” from the rotational labor they perform with each other. “This sort of collective labor resists individualization,” said Freeman. Farmers’ refusal to abandon their practice of collective labor or integrate the individualized labor championed by international actors into their daily labor is a form of resistance to external forces and a mode of preserving Haitian popular sovereignty. While connecting soil and farm labor to sovereignty may seem like a stretch at first, it’s just one example of how Haitians engage with larger, more problematic international forces, like interference in domestic elections and the continued presence of a UN military force, while maintaining power over their own lives. “For as many ways as you can point out that Haiti is controlled by international actors and what’s called the ‘international community,’ in Haiti, there’s just as many moments where there’s resistance to incorporating those policies or those religions or those ideas into society,” said Freeman. Effective spending of foreign aid requires understanding “the way that Haitian people are continually working together to support each other in a collective way,” said Freeman. A better understanding of that community-centered mindset and the incorporation of that mindset into development projects is essential to improving the lives of rural farmers.